A most important part of the curriculum of the ancient mysteries was instruction in cosmology, the science of the universe. The intention of that instruction was to disclose to candidates the physical and metaphysical constitution of the world and the place and destiny of man in it. 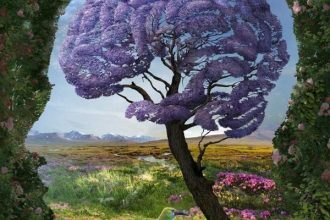 They were shown how the complex human organism reproduces the great world and summarizes it in small, so that man may see himself to be a microcosm or miniature copy of it. Skepticism, freedom and independence of thought about matters of a more or less occult nature have their undoubted place and value in the outer ways of the world. But they are foreign to and inconsistent with the mental attitude appropriate to those who, on entering a hall of initiation, are supposed to tyle the door to the outside world and its conceptions, and, divesting themselves of all ideas there pre-acquired, to offer themselves as humble teachable pupils of a new and authoritative order of knowledge. Where everyone claims to be already possessed of a sufficiently satisfactory explanation of the universe and his place in it, or is content to get along without one, and in either case prefers his private judgment to any other that may be offered him, the soil for making initiates in any real sense is distinctly unfavorable. For such, however, these pages are not written. 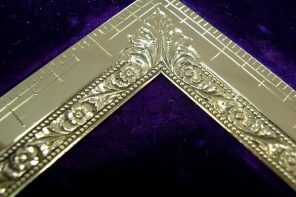 They are offered only to the minority of brethren eager to learn what Masonry has to teach them upon matters in which they earnestly seek knowledge and guidance. 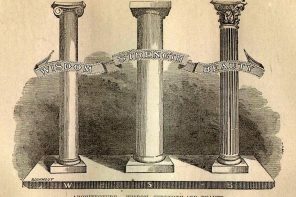 Masonry, then, in exhibiting to them a simple ladder offers them a symbol the significance of which is calculated to open widely the eyes of their imagination. 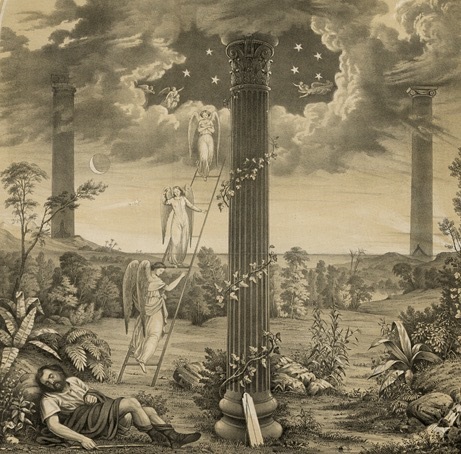 It is true that in the Instruction lecture the ladder is expressly referred to that of Jacob in the familiar biblical episode, and that that ladder is then given a moral significance and made to suggest the way by which man may ascend from earth to heaven by climbing its symbolic rungs, and especially by utilizing its three chief ones representing the virtues Faith, Hope and Charity. This moral interpretation is warranted and salutary. But it is far from exhaustive, and conceals rather than reveals what “Jacob’s ladder” was really intended to convey to the perspicuous when the compilers of our system gave it the prominence they did. We may be assured they had a much deeper purpose than merely reminding us of the Pauline triad of theological virtues. The ladder, then, covertly emphasizes the old cosmological teaching before referred to. It is a symbol of the universe and of its succession of step-like planes reaching from the heights to the depths. It is written elsewhere that the Father’s house has many mansions; many levels and resting places for His creatures in their different conditions and degrees of progress. It is these levels, these planes and sub-planes, that are denoted by the rungs and staves of the ladder. And of these there are, for us in our present state of evolutionary un-foldment, three principal ones; the physical plane, the plane of desire and emotion, and the mental plane or that of the abstract intelligence which links up to the still higher plane of the spirit. These three levels of the world are reproduced in man. The first corresponds with his material physique, his sense-body; the second with his desire and emotional nature, which is a mixed element resulting from the interaction of his physical senses and his ultra-physical mind; the third with his mentality, which is still farther removed from his physical nature and forms the link between the latter and his spiritual being. The ladder, and its three principal staves, may be seen everywhere in nature. It appears in the septenary scale of musical sound with its three dominants; in the prismatic scale of light with its three primary colors; in our seven day scale of weekly time, in the septenary physiological changes of our bodily organism, and the similar periodicities known to physics and indeed to every branch of science. The perfect lodge has seven members, including three principal officers. The advancement of the third degree candidate to the East is by seven steps, the first three of which, it will be remembered, are given special significance. Thus the universe and man himself are constructed ladder-wise, in an orderly, organized sequence of steps. The one universal substance composing the differentiated parts of the universe “descends” from a state of the utmost ethereality by successive steps of increasing densification until gross materialization is reached; and thence “ascends” through a similarly ordered gradation of planes to its original place, but enriched by the experience gained by its activities during the process. 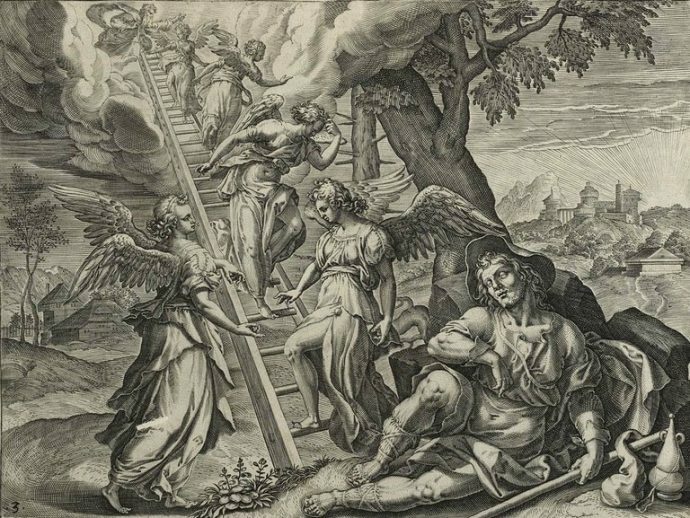 It was this cosmic process which was the subject of the dream or vision of Jacob and which accounts for “Jacob’s ladder” being given prominence in our symbolism. What was “dreamed” or beheld by him with super-sensory vision, is equally perceptible today by any one whose inner eyes have been opened. Every real initiate is one who has attained an expansion of consciousness and faculty enabling him to behold the ethereal worlds revealed to the Hebrew patriarch, as easily as the uninitiated man beholds the phenomenal world with his outer eyes. 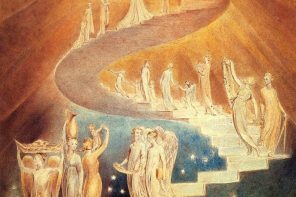 The initiate is able to “see the angels of God ascending and descending” – that is, he can directly behold the great stairway of the universe and watch the intricate but orderly mechanism of involution, differentiation, evolution, and re-synthesis, constituting the life-process. He can witness the descent of human essences or souls through planes of increasing density and decreasing vibratory rate, gathering around them as they come veils of matter from each, until finally this lowest level of complete materialization is between the real self and the unreal selves and veils built round it, has to be fought out on the checker-work floor of our present existence, among the black and white opposites of good and evil, light and darkness, prosperity and adversity. Jacob’s vision and ladder, therefore, exemplify the attainment of initiation, the expansion of consciousness that comes when the Light of the center is found, and the cosmic vision that then becomes possible.